A spray-on mixture of carbon nanotubes and ceramic that has unprecedented ability to resist damage while absorbing laser light has been demonstrated by researchers from the National Institute of Standards and Technology (NIST) and Kansas State University. Coatings that absorb as much of the energy of high-powered lasers as possible without breaking down are essential for optical power detectors that measure the output of such lasers. These are used, for example, in military equipment for defusing unexploded mines. The new material improves on NIST’s earlier version of a spray-on nanotube coating for optical power detectors and has already attracted industry interest. 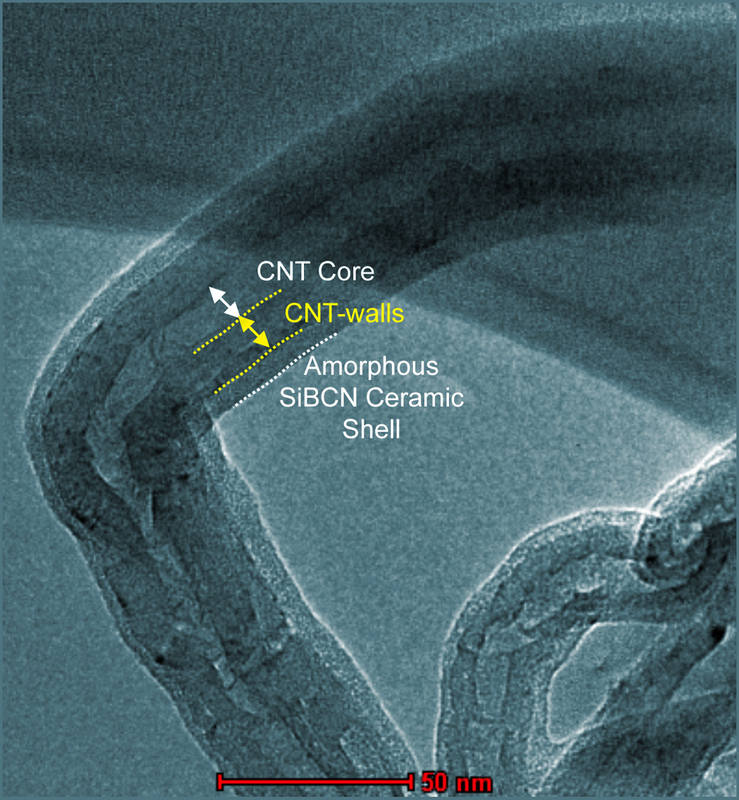 The new composite consists of multiwall carbon nanotubes and a ceramic made of silicon, boron, carbon and nitrogen. Boron boosts the temperature at which the material breaks down. The nanotubes were dispersed in toluene, to which a clear liquid polymer containing boron was added drop by drop, and the mixture was heated to 1,100 degrees C. The resulting composite was then crushed into a fine powder, dispersed in toluene, and sprayed in a thin coat on copper surfaces. Researchers baked the test specimens and then exposed them to a far-infrared laser beam of the type used to cut hard materials. Analysis revealed that the coating absorbed 97.5 percent of the light and tolerated 15 kilowatts of laser power per square centimeter for 10 seconds. This is about 50 percent higher damage tolerance than other research groups have reported for similar coatings — such as nanotubes alone and carbon paint — tested with the same wavelength of light, according to the paper. The nanotubes and graphene-like carbon absorb light uniformly and transmit heat well, while the oxidation-resistant ceramic boosts damage resistance. The spray-on material also adheres well to the copper surface. As an added bonus, the composite can be produced easily in large quantities. After light exposure, the coatings were analyzed using several different techniques. Electron microscopy revealed no major destruction such as burning or deformation. Other tests showed the coating to be adaptable, with the ceramic shell partially oxidizing into a stable layer of silicon dioxide (quartz).